From Derek McInnes’ high school romance with Rangers to a Hearts fan’s spectacular rendition of Coldplay’s Fix You, Twitter was hilarious in 2017. The only place Scottish football fans are more vocal than when singing in the stands is when they’re pouring their emotions into Twitter. In 2017, years of development and breakthrough technology finally allowed Twitter to do the unthinkable and extend tweets to 280 characters, infinitely expanding the potential for social media tomfoolery. Scottish football fans were quick to make use of the extra leg room. 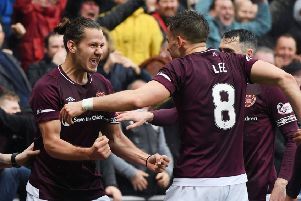 Of course, Rangers weren’t the only target - the end of Celtic’s unbeaten domestic run at the hands of Hearts drew a lot of laughs, as did Derek McInnes anticlimactic ‘will-he-won’t-he’ dalliance with the Ibrox hierarchy. In the video above, we’ve included some of the best, but you’d likely be here until New Year if we’d tried to include them all. There were some gems we just couldn’t fit in. Sky Atlantic (@skyatlantic) announcing to Twitter it was making Albion Rovers their Scottish football team after an Alan Partridge tweet. Craig Telfer (@CraigGTelfer) tipping his cap to Stenhousemuir for seemingly signing Michael and Ross Dunlop to the club... in a McDonalds. Tranent Juniors (@TranentJRs_FC) informing their followers that opponents Oakley were reduced to 10 men after the keeper jumped the barrier to brawl with fans. The award for creativity should really go to Hearts fan Liam (@HMFCLiam) who painstakingly typed out Coldplay’s Fix You line by line, each with an image detailing recent goings on at Tynecastle. For some of the funniest Scottish football tweets of 2017, be sure to check out the video above.